posted November 29, 2017 11:54 PM bonus applied by kiryu133 on 30 Nov 2017. Edited by NimoStar at 07:19, 04 Dec 2017. Delete previous versions of Greatest Mod before this anyways. NO FILE should be overwritten if you install properly. All the files of the mod are unique and named differently from other mods and the original game. v- Now Mantis and Megadragon are max level creatures normally. Thunderbird AND Gargantuan are on Summoning Portal. v-- Mythical Dragons have... who knows. Let's go with Blinding. v untested- Fix Guardian Angel, counts as Healing spell, costs more mana. V- Now many terrains are upgraded with noticeable mix of fractal patterns, giving more life to the maps. v- Switched internal and external fort-citadel-castle graphics and animations of Order and Light town. That is not all but yes most for now. I'm not H4 player, but I observe your work for some time. Great work indeed! Hope you'll make your addon bigger and bigger in the future!! You basically revived a dead forum by yourself. Is mod fully playable and balanced online? I am interested only in multiplayer game. Its all ok I can offer you promotion on our league website. I would definitely try it if all my gaming time wasn't eaten by Creature Quest. Anyway huge thumbs up, +QP please. Edited by NimoStar at 17:26, 30 Nov 2017. Yes, at least my attempt was that it is even better balanced than Equilibris. I took obsessive care with balancing stats; for example, all expansion creatures (Like Sorceress and Dark Knight) gave insane amounts of XP before, now the XP of each creature is carefully attunned to their ingame power. You may need some time to get used to the new factions, though, as all creature lineups and many abilities are changed. Thanks people for your comments! Please give feedback on your play experience with the mod, if anything can be corrected or new features included, it will. Also, please see here to support request about being able to edit the original thread. Edited by Baronus at 22:13, 30 Nov 2017. There is 8 factions right? And mod is not playable on old equilibris maps? Actually real factions is hardcap at 6 - but all have been changed. Soon I will release another thread with faction spotlights, so people that come from regular H4 can transition smoothly. There is an "additional" faction (besides the creature portal, that AI can't use normally; yet there is a script for this) but it is not a town. If we count both Portal and the "detowned" Haven this way, there is eight factions; but otherwise only 6 are normal, playable multiplayer factions. Mod is compatible with both normal and equilibris maps. However, wait until tonight for the hotfix to play on the equilibris ones, since I forgot to include the file with the equilibris objects in the test release. Two(2) very important files have been recognized as being dangerous to my PC by my Norton Anti-virus software. Both of them are .dll files that are needed to launch the game. Side note: The Age of Heroes Headlines' articles' that were conceived to scroll right to left on this web-site just went hay-wire. Besides all those unfortunate happenings, have a very nice day to you. Your anti-virus says danger because it doesn't recognize its source. You can allow these dlls and you're computer won't collapse, this is a mod from a trusted member of this community, not a malware from suspicious website. Write to Bill Gates. Newest windows recognised H4 as a virus :-):-):-) Its a lot of times. Try compatibility with winxp mode. I got bored really fast of HOMM4 for several reasons, first it was the growth of neutral creatures on big maps was completely unbalanced, specially on harder difficulties, that annoyed me the most. The dumb AI that at some points would sit on their town doing nothing, not exploring or even picking up items around their town. Then we have spells, each town seemed to lack something except for maybe order. Death spells sucked because they had to rely on debuffs almost exclusively and the summoning depended on killing enemy army to be usable. Chaos spells were the only decent damage dealing spells. Illusions were kind of overpowered if you could stall the fight. Nature was underwhelming with all the summoning. Life was fine i guess, don't really remember. If you manage to address those problems you'll make this game what it was meant to be in the first place. I have one question/request though: Is there a single, summary changelog from vanilla H4 to V18 of your mod? That would be very beneficial to understand what you achieved overall, and to gauge our experience playing it. Thanks and a big kudos!! ...trying to troubleshoot this newest mod v.18 of yours. Now, it says that there is a non-compatibility error through the C++ runtime library. I would like to be able to bring back the version 16 of this mod of yours. The previous one was working perfectly. I have version 1709 of Windows 10 x64 with 2 or 3 more cumulative updates onto this latest version. Would that be a major problem? Running the latest release of Win 10, I had no trouble installing HIV nor this mod. At first run, I didn't get any picture, just sound, but returning to windows with the Win key and coming back to the game resolved it. Edited by NimoStar at 13:53, 04 Dec 2017. The release of the mod is now fixed with included Equilibris .355 objects and map compatibility, this should fix some issues including with the editor. PS: You can overwrite the fixed .18 version to the test .18 version with no problems. I run it in window mode on win7 64 bits without compatibility options even. Never had problems of windows sort. In my personal opinion win10 is bad for legacy software, but people here say they play h4 equilibris on win 10 and this is the same. So my recommendation is the same as install instructions: Use a CLEAN install of the game (needs both expansions of the original game BTW, won't work on regular H4). Slimes are powerful at game start because Hp and damage, but they lack att and def stats. Against tier 1 monsters they will rule, but they will lose even to other tier 2 monsters at equal week recruitment equivalency. Also, remember you will lose necessary mercury to upgrade buildings of your town in the later game, so it's a tradeoff really. I admit using rare resources for creatures less than max tier is one of my more "unorthodox" ideas. Try seeing the original thread of the mod (http://heroescommunity.com/viewthread.php3?TID=42758), but a new thread of mod features and faction spotlight is upcoming. Anyways, the moddb page gives a summary of the changes in main. Creature growth of neutral stacks is exponential, growth of creatures in town is linear. This is normal Heroes mechanics. In my mod this is somewhat easier because more and more powerful spells and artifacts are available, but you still have to rely on skill on "the harder difficulties". Also to not fight neutral stacks that way try custom campaigns and maps, multiplayer like Brennus says, or fighting ai. 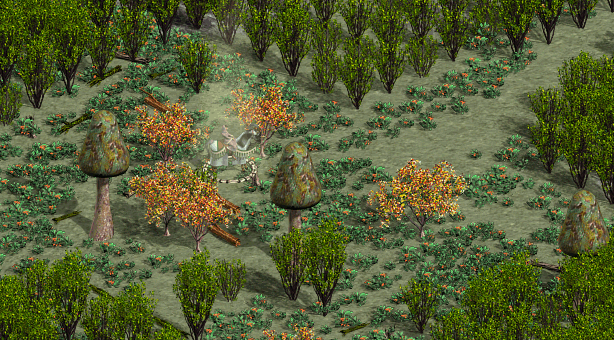 AI has chronic lack of resource management and it is very cautious to pick fights. In my custom maps AI gets free resources every day so it is much more proactive; it will build up and make armies bigger than yours, THEN it will attack. AI in combat is not so bad, the bad one is map AI. Also you have to make sure to fight in less than equal terms. AH, my mod is then perfect for you! I, too, thought the default magic schools were underwhelming. Like 10 spells have been added, and many changed schools, so each schools is not as "Monotematic" as before. In versions future if I continue the mod it is possible I will replace the five magic schools for completely reshuffled ones with new icons, descriptions and changed spells. THis is theory for now but I have developed the capabilities to do it already, it si only about working on it (a very nontrivial thing). As you can see, I adressed them to the best of my ability, though it is still a work in progress, with lack of tools and against odds. Both graphics and code are very closed, if not the update would have been much more massive with extra creatures and renewed UI. But anyways, try the mod, specially the finished custom maps, and then tell us what you think. I assure you the gameplay experience is very different from vainilla h4. Well I simply have to congratulate you on your progress NimoStar. Because, I concluded that I had to mod this Heroes of Might and Magic 4 Complete with the 13 years old mod of Equilibris v.3.5.1(2004) and, it worked like a charm. Except having to put its native original resolution to 1024 x 768 in order to have that game's full spectrum of my monitor/Television set(fully stretched up to the extreme 4 corners of its widescreen size). Played its tutorial thoroughly without any crash what-so-ever. Even got the 7th place in the Hall of Fame as for single map completion like score. Wish you way better luck in your future endeavours at attempting to improve the game play experience of this aging title of Heroes 4: Equilibris v. 3.5.x.